Download the RNB2000 technical catelog in PDF. 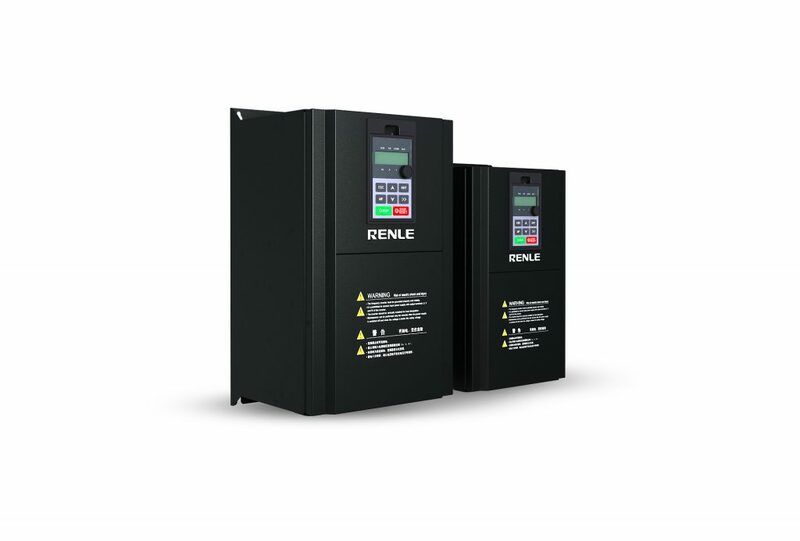 RNB2000 series frequency inverters meet requirements of high standards for production technology in different high-end applica- tions, depending on their high-end control platform, rich interface resources, multiple communication modes, advanced control algo- rithm and flexible extension interfaces. The frequency inverters adopt new generation of digital signal processor (DSP) of TI, USA for motor control. The main frequency can reach 150MHz. The frequency inverters adopt 4th generation of IGBT of Infineon, Germany. The frequency inverters further lower switching loss, depending on the feature of 175 oC highest junction temperature and new PWM mode. So the driver can operate without derating in the environment of 50 oC. The frequency inverters support drive of asynchronous motor and permanent magnet synchronous motor. They can accurately discriminate the parameters of asynchronous motor and permanent magnet synchronous motor and allow presetting of two groups of motor parameters. They allow switching of control for the driver between two different motors. The switching function can be set by communication or multifunctional terminals. Under V/f control mode, the frequency inverters offer high-precision current limiting control. So the driver gets rid of overcurrent alarm no matter in fast acceleration/deceleration or during locked rotor. In such way the driver is protected reliably; Under vector control mode, high-precision torque limiting control allows the driver to output strong or soft torque according to the technological control of the user, and so reliably protect the mechanical equipment. Under the V/f separation control mode, the output frequency and output voltage can be set separately. This mode is applicable to applications such as frequency conversion power supply and torque motor control etc. Smart extension interface allows simultaneous connection of two extension cards, so it can meet the special control requirements of industries. When the encoder is positioned not at the shaft end, PG vector control can still be realized if the deceleration ratio between this axis and the motor axis is kept fixed. Speed search, accurate and reliable, can enable no-impact smooth start of rotating motor. Process PID control owns abundant giving and feedback modes. Two groups of proportion, inte- gration and differential parameters can be switched freely. Positive and negative action feature can be selected. This control is applicable to energy saving of fans and pumps. The inverter supports input of DC power and enables user to arrange application of common DC bus. Overvoltage stall protection: During fast decel- eration of large inertia load, the regeneration energy may result in overvoltage fault. The instan- taneous adjustment of output frequency can reduce the probability of overvoltage tripping, so the continuous and reliable operation of the system is ensured. Undervoltage adjustment: When instantaneous undervoltage or power failure occurs, the DC bus voltage remains constant depending on the auto- matic reduction of output frequency, so the continu- ous operation of the driver within short time is guar- anteed. This function is applicable to application of fans and pumps. Overcurrent stall protection function: During fast acceleration of heavy load, the instantaneous large slip may result in overcurrent fault. The instanta- neous adjustment of output frequency can reduce the probability of overcurrent tripping, so the con- tinuous and reliable operation of the system is ensured. Low frequency oscillation suppression function: During no-load or light load start of large power motor, the acute oscillation may occur and result in fault tripping. Enabling this function can suppress oscillation effectively and ensure reliable operation of the system. Wave-by-wave current limiting function: During heavy load start or abrupt increase of heavy load, this function enables automatic limitation of the output current before the overcurrent fault occurs, and avoids frequent tripping of the frequency inverter. Copyright © 2018 renle.eu. Alle Rechte vorbehalten.